Offering you a complete choice of products which include silica gel bags. We are the leading manufacturer of Silica Gel Bags. which are extensively used for keeping surroundings free from moisture in agricultural, pharmaceutical, aviation, and cosmetic industries. Our silica gel is extremely pure in composition and has a stabilized pH. The pouches are available in different sizes and can be customized owing to the manufacturing unit we harbor. 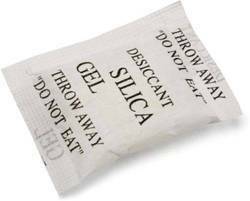 Looking for Silica Gel Bags ?